My second day at the Columbia River Gorge started with another drive across the Bridge of the Gods. 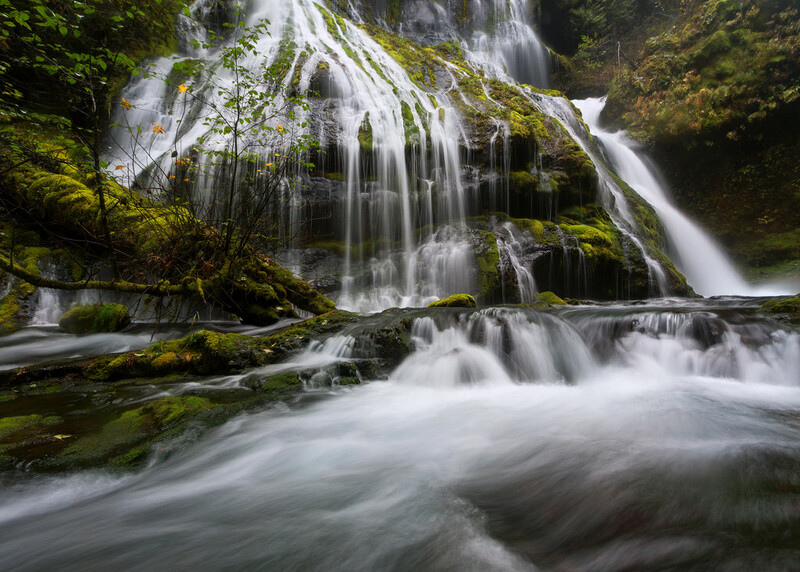 I was heading to Panther Creek Falls, a little-known but strikingly beautiful waterfall tucked away in Gifford Pinchot National Forest about 12 miles north of Carson, Washington. There were no signs from the road, but my directions were solid and I didn’t have any trouble finding the short trail that leads to a deck above the falls. The view from the deck was fine, but for better photos I’d need to get down to the base. I assumed it would be simple to cut down to the creek, but the slope was so steep that the only route I could find dropped over a rocky cliff about twice my height. It looked very climbable, with good handholds and a flat ledge halfway down. But was it climbable for me? I was carrying a lot of camera gear, I had on Keen sandals instead of hiking shoes, and the rocks were wet with mist. Not to mention the fact that I’ve been known to wipe out on a perfectly level path. Also, Oregon kind of spooks me. Nature feels heightened in the Pacific Northwest, even more intense and indifferent than in other places. Less forgiving. I could easily picture myself slipping from the rocks and breaking a leg. How would I get back up? There was no cell coverage. The last person I saw was all the way back in Carson. I don’t think anyone even knew where I was. From a level-headed evaluation of the best-case vs. worst-case scenarios, it made no sense. But I had to give it a try. I went slowly and made it down without slipping, although it became clear that getting back up would be the tougher part. 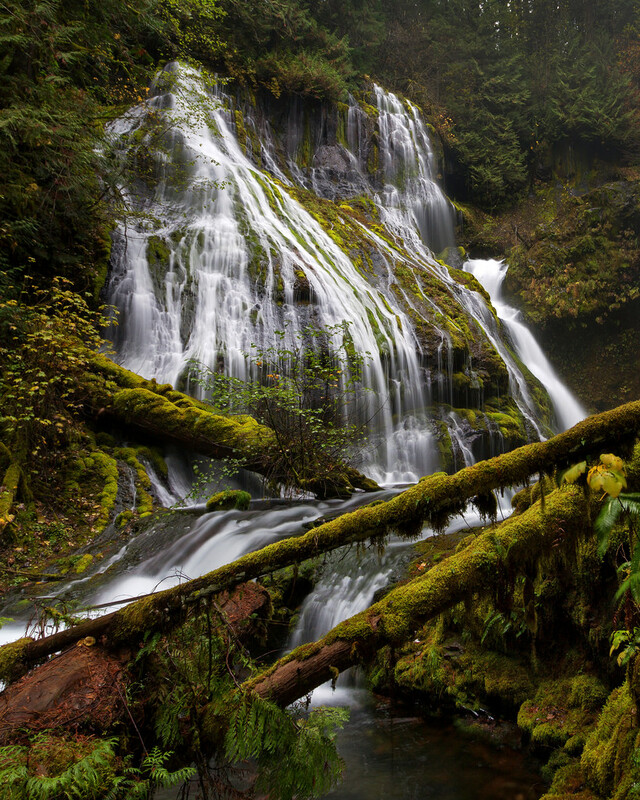 The adrenaline-enhanced experience of standing at the base of Panther Creek Falls was intense. I spent the better part of an hour taking photos, battling the whole time to keep my camera lens dry. I did my best to appreciate being in such an incredible place. Eventually I had to face the climb back up. Reaching the halfway point turned out to be relatively easy, but then I hit a spot where I needed to move from one foothold to another and couldn’t find a grip to steady myself. Any rock climber wouldn’t have given it a second thought, but I was genuinely scared. My heart raced. It was far from elegant, but I made the move and got a good grip again. What a relief to reach the top. Afterwards I looked online to see if there was an easier way down, fully expecting that I’d missed a better option. Turns out I’d gone the right way, but most of the other descriptions make mine sound overly dramatic. One just says, “there’s a little light rock climbing involved.” Another suggests bringing a rope, which seems like good advice. All that and it wasn’t even 9am yet. Next on my list was a small but extremely photogenic waterfall that doesn’t have an official name. 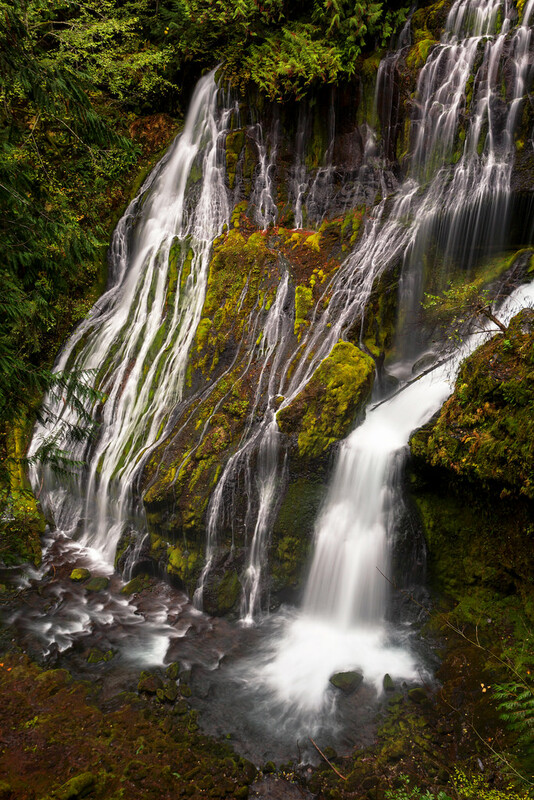 Some call it Lower Ruckel Falls, but Mossy Grotto Falls is the name used more often by photographers and has the advantage of being a perfect description. No maintained trail leads there, but apparently I could reach the falls by following the Ruckel Creek Trail for about a mile and then bushwhacking down yet another steep slope. As usual the route I took ended up being tougher than it needed to be, but at least this time no rock climbing was required. What a cool little spot! 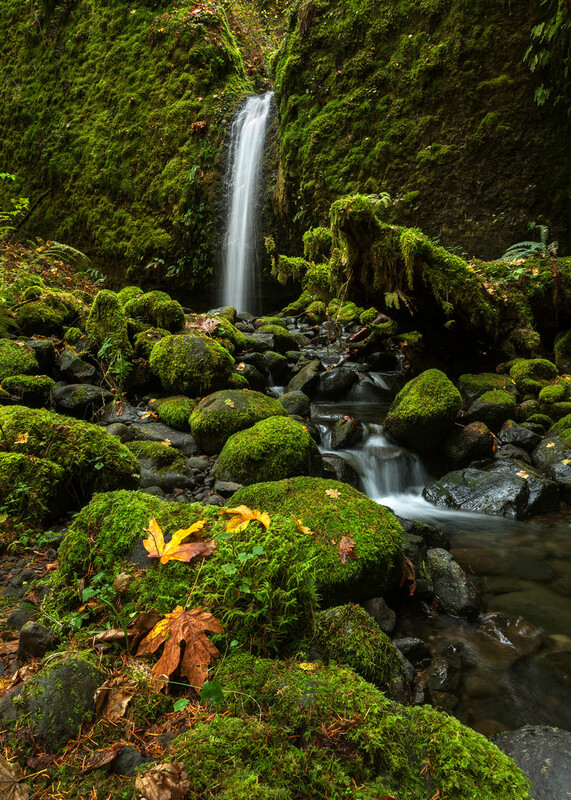 I liked Mossy Grotto Falls so much that I decided I’d need to visit again in the spring when the water level is higher and the blanket of moss is even greener. 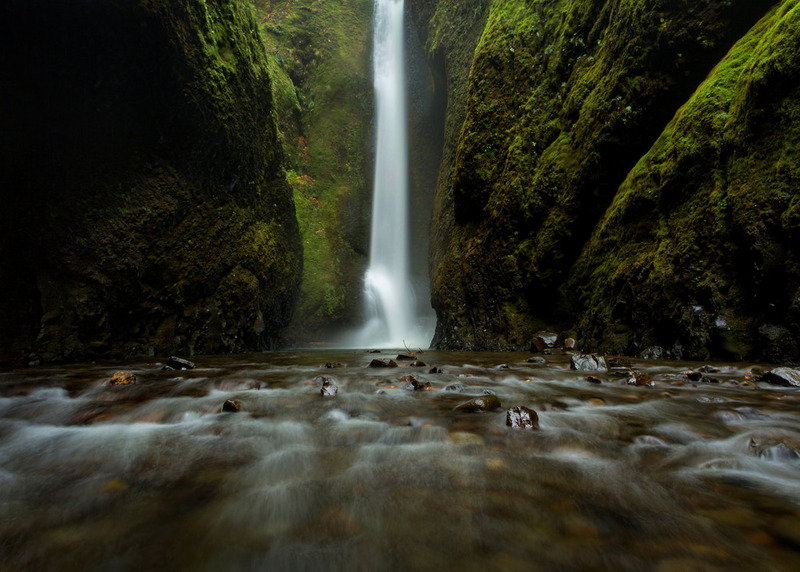 My last challenge of the day was to reach Lower Oneonta Falls. No steep climbs would be involved this time, but I’d have to deal with a logjam and some icy water. 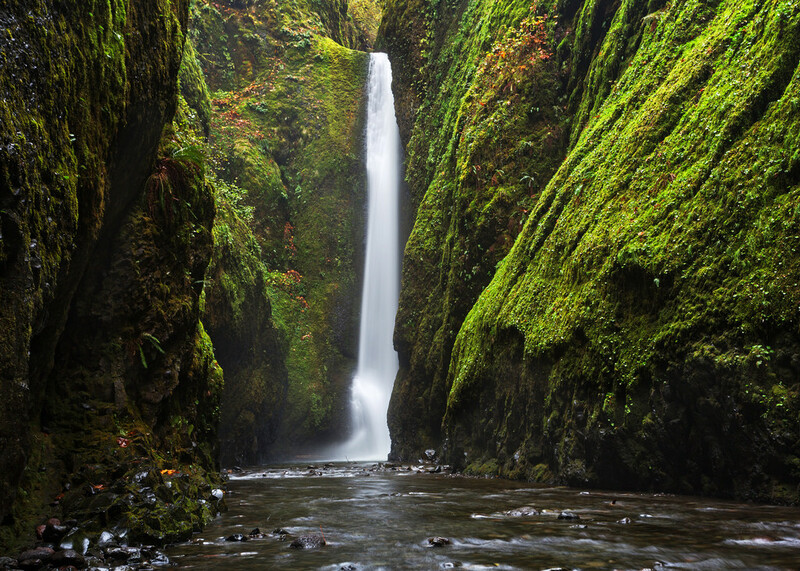 The hike to Lower Oneonta Falls is a little like the Columbia River Gorge’s version of the Narrows in Zion National Park. 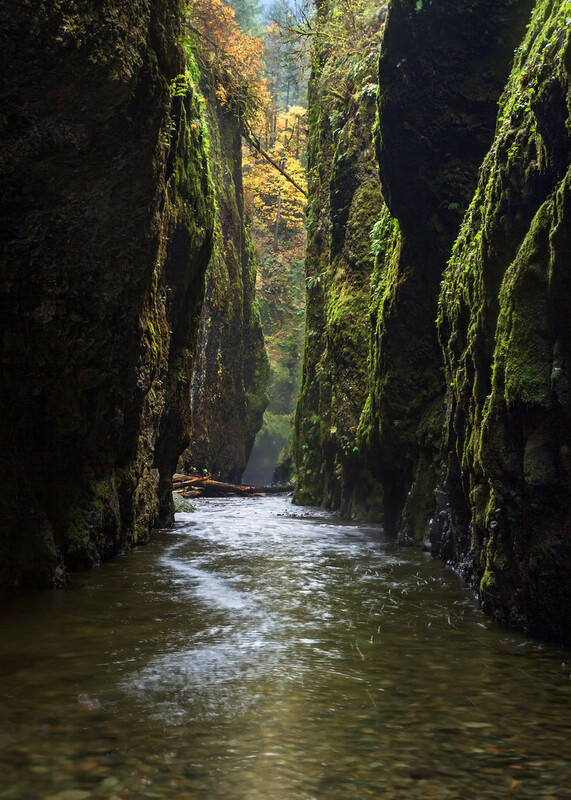 Like the Narrows, you walk in the river itself and there are vertical rock walls rising on both sides. 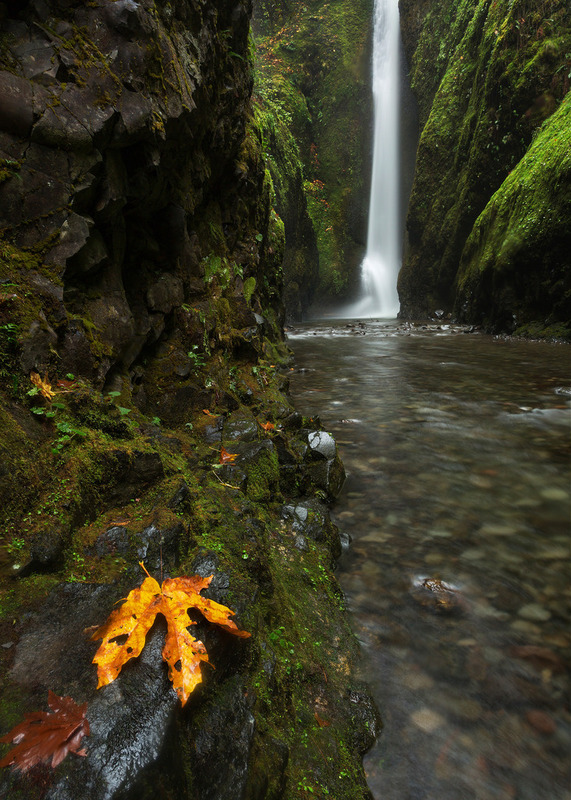 Lower Oneonta Falls is less than a mile away from the entry point to Oneonta Creek, so it’s a short hike. 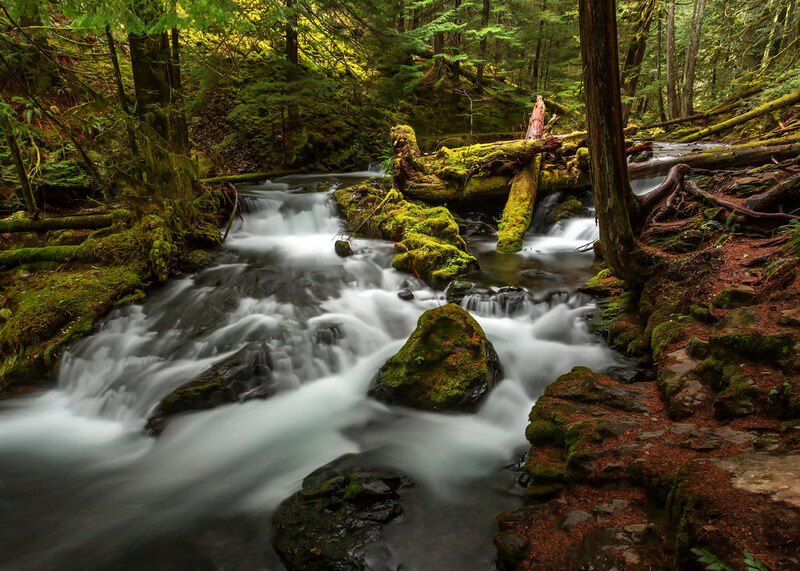 But at the start you have to scramble over a wild tangle of massive logs, and – depending on the water level – there are parts of the creek that can be so deep you need to swim. I’d read many descriptions of the hike online, and some people even go so far as to rent wetsuits. I’m admittedly a baby about the cold, but renting a wetsuit for such a short hike seemed ridiculous. I decided to just wear quick-dry shorts and hold everything else above my head when necessary. My Keen sandals worked well in the Narrows and I figured they’d be fine here, too. My first step into the creek was a little alarming. Ice cold! I was happy to reach the logjam so I could climb out of the water and regain the feeling in my toes. 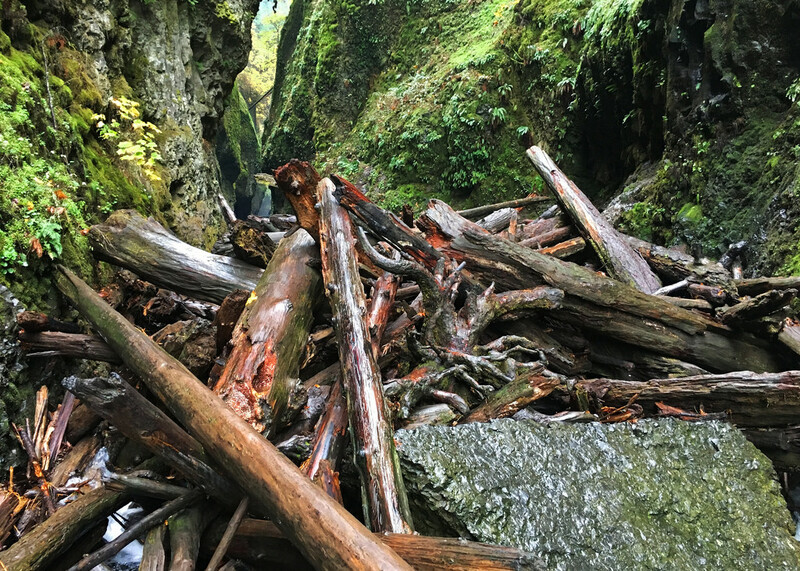 Some descriptions of the hike make the logjam sound like a major obstacle, but I just went slowly and carefully and had fun climbing around on the logs. A guy in his 20s was standing on the far edge the logjam taking photos of the gorge. “Are you going in?” he asked. The water just beyond the logjam was waist-deep. Grateful that the air temperature had risen into the 50s, I lifted my backpack above my head and stepped off the logs. Ooof! A shock to the system, but not nearly as painful as I expected. 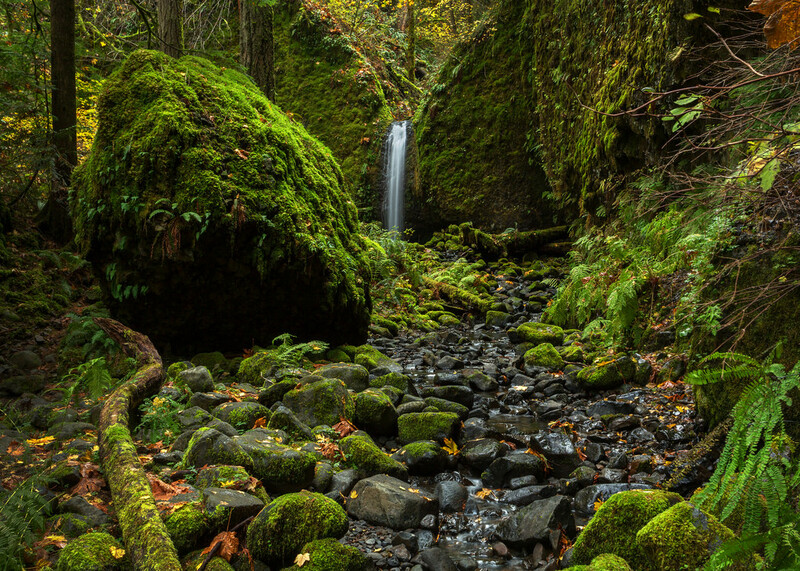 Soon I was back in shallow water walking alone beneath the gorge’s towering moss-covered walls. The beauty of the place quickly pushed away any sense of cold. Tiny streams dripped down from the misty heights on both sides. I began to wonder if the water level was so low that I could reach the falls without having to submerge the top half of my body. No such luck. As the sound of the falls grew louder I reached a narrow stretch of deep water. With my backpack above my head, I plunged in and hoped the water wouldn’t rise above my head. Thankfully my chest barely got wet before I rose up again to shallow water. And then Lower Oneonta Falls came into view. The spray from the waterfall made it almost impossible to keep my camera dry. After a round of photos I left my camera sheltered behind a rock and walked right up to the base of the falls, the waves of mist hitting my jacket like rain. I was startled to hear a voice. “Hello!” said the photographer from the logjam, who’d decided that getting wet and cold was a small price to pay to see the falls. “Definitely worth it!” I agreed.